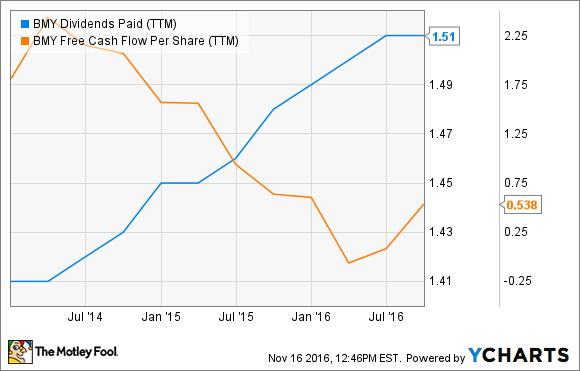 Can Bristol-Myers Squibb's Dividend Even Survive? Cash generated by Bristol's operations is spread pretty thin. Should shareholders brace for another years-long dividend freeze -- or worse? The 21st century hasn't been easy for yield-hungry Bristol-Myers Squibb (NYSE:BMY) shareholders. The company froze its quarterly payout at $0.28 from 2001 through 2007, and the last four payments of $0.38 constitute a dismal growth rate of about 2.65% over the past 16 years. Despite such cautious raises, the dividend is teetering on the edge of sustainability. Can Opdivo sales grow fast enough to support further increases, or should investors brace for a pay cut? Let's take a closer look at Bristol's finances and the competitive landscape to uncover its main growth-driver and find out. During the first nine months of 2016, Bristol-Myers Squibb paid $1.9 billion to shareholders in the form of dividends and generated about $3.6 billion in net income over the same period. On the surface, a 53% payout ratio -- the percentage of net income distributed as dividends -- during this period hardly suggests a problem. Bristol's free cash flow of just $578 million in the first nine months, however, tells a much different story. Free cash flow is cash generated by operations minus capital expenditures spent to keep those operations humming along, but income investors like to view it as funds available to distribute as dividends or share buybacks. It's a useful barometer in situations like this, because it generally strips away non-cash charges and events unrelated to operations that impact net income figures. It can get a bit complex, but you don't need an accounting degree to understand that a business simply can't distribute more cash than it generates for very long. BMY Dividends Paid (TTM) data by YCharts. The disparity between Bristol-Myers Squibb's net income and free cash flow this year owes largely to asset sales and $500 million in deferred income tax payments. In February, the company sold a collection of not-yet-approved HIV assets to a joint venture formed by GlaxoSmithKline and Pfizer, known as ViiV healthcare, for $350 million up front. In May, it sold its interest in an over-the-counter drug business for another $317 million. The candidates sold to ViiV could generate up to $5.4 billion in milestone payments, plus royalties, but this revenue stream is far from guaranteed, given the increasingly competitive HIV space. Bristol-Myers Squibb exited September with about $4.2 billion in working capital. This might be enough to continue raising its dividend gradually, but it needs to ramp up sales in the years ahead to avoid slashing the payout. Until recently, Bristol's star cancer immunotherapy looked like it was up to the task, but a recent clinical setback cast a shadow over Opdivo's growth story. The exciting therapy blocks the PD-1 shutoff switch on immune cells, which many tumors exploit to avoid attack. Unfortunately, it's not the only drug of this class. Keytruda from Merck & Co. (NYSE:MRK) operates the same way, and Tecentriq from Roche acts on tumor cells to block the same switch. Over the past year, Opdivo sales soared after the FDA expanded its label to include patients with the most common type of lung cancer, but only when their disease progresses during or after standard chemotherapy treatment. Bristol tried to prove Opdivo could also work in newly diagnosed, untreated patients, but the drug failed to outperform standard chemo in a head-to-head trial with this group. Among patients with PD-L1 -- a protein that throws the PD-1 shutoff switch on immune cells -- on 5% or more of their tumor cells, at least half treated with standard chemo progressed after 5.9 months, versus just 4.2 months in the group treated with Opdivo. Opdivo's growth story took another turn for the worse in October, when the FDA approved Merck's Keytruda for a similar population. Its main competitor became the first chemo-free option for newly diagnosed lung cancer patients with PD-L1 on at least half of their tumor cells. Compared to standard chemo, Keytruda lowered the risk of disease progression or death by about 50%. In the U.S., lung cancer is the most deadly malignancy, and it looks like Keytruda will soon knock Opdivo out of the lead in this important indication. Luckily for Bristol, Opdivo has the jump on Keytruda in kidney cancer and Hodgkin lymphoma. Although its lung cancer setback might knock a few billion off the therapy's peak sales potential, Opdivo sales are still expected to top out around $10 billion by 2025. Third-quarter Opdivo sales suggest an annual run rate of about $2.8 billion. If Bristol's main growth-driver doesn't disappoint again, then maintaining and raising its dividend at a faster pace than investors have grown accustomed to isn't out of the question. Bristol tends to announce payout raises in December, and another $0.01 bump would provide a 2.77% forward yield. If you're uncomfortable with future increases that are largely dependent on Opdivo's continued success, then it might be a good idea to look elsewhere.